As you have probably gathered from the images posted on Active Angling I am a firm advocate of wearing camouflage clothing when fishing the flats, especially when using a fly rod. 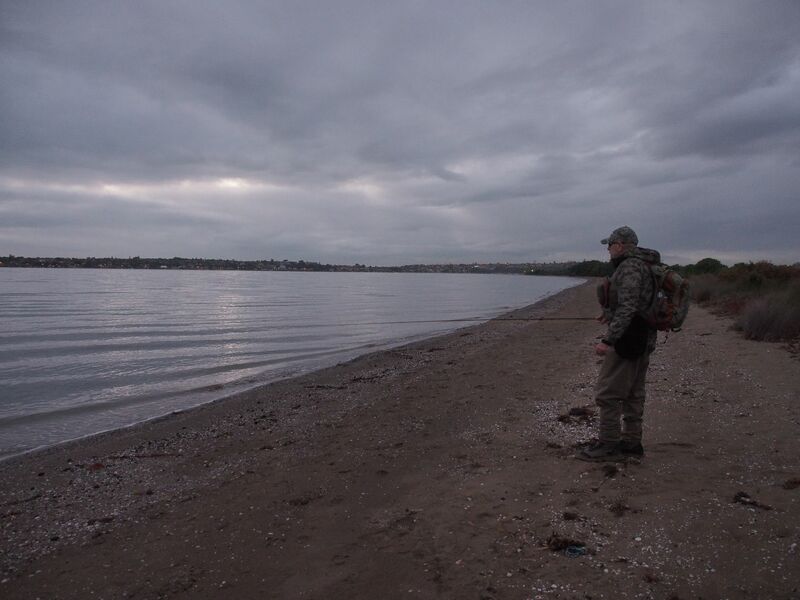 While it may not make much of a difference what you wear if you only fish around dawn or dusk once the sun rises and bathes the flats in light then blending in using camouflage clothing suddenly becomes important. This is especially true if there is vegetation on the horizon behind you when you are standing in the margins. 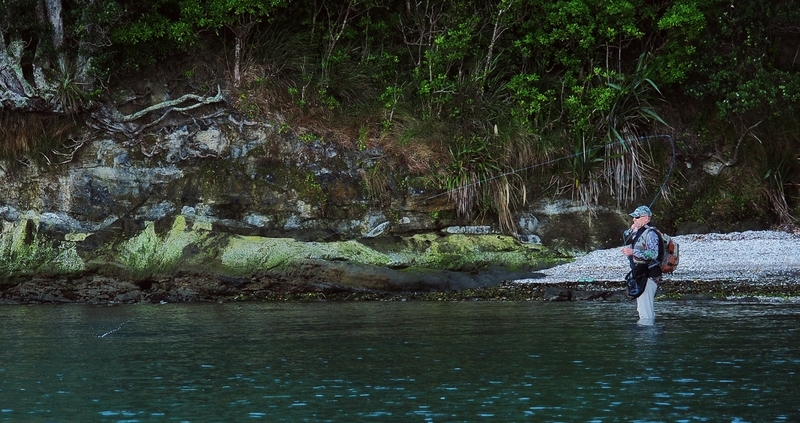 Firstly most fly fishermen only have a comfortable casting range of 20 – 27 metres (65′ – 90′). This means it is critical to approach the water slowly and carefully so as to not scare any fish that are potentially feeding within casting range. Anything that makes it more difficult for fish feeding in the shallows to see you obviously has to improve your chances of success. Dull natural coloured clothing helps but camouflage clothing also breaks up the anglers outline and this tilts the odds further in your favour. Note that even wearing camouflage, it is still important when stalking to get low (crouching or kneeling) so that your outline is not silhouetted on the horizon. Obviously if you are spin fishing and regularly casting 55 – 60 metres then it could be argued that camouflage clothing is unnecessary, especially if the fish are holding well offshore. Also if you are fishing from a boat then camouflage clothing is surplus to requirements as you are inevitably silhouetted against the sky. I began wearing camouflage clothing on the flats about six years ago when I was looking for ways to improve my stalking success. The reason for experimenting with camouflage initially was that it helped me bag more game when hunting in my youth so I reasoned that it would probably also work when on the sand flats. This turned out to be the case as immediately after switching to camouflage I went four years without blanking on my favourite estuary. Prior to donning camouflage I wore neutral drab green or olive clothing and my diary notes showed that I blanked once every three or four sessions. This improvement in success was enough for me to change my approach forever. Secondly donning camouflage seems to change my mind set. This may sound silly but it is almost as if I switch into a more serious hunting mode when I put on camouflage clothing. A friend calls it “putting on my game face”. It is more than a subliminal effect as others have observed that I slow down and move more carefully and deliberately when appropriately dressed. Over the past 12 – 18 months I have got even more finicky about wearing camouflage clothing, even to the point of wearing waders that match the sand colour, and some very interesting things have happened as a result. I regularly see baitfish swimming to within a rod length and on two separate occasions these baitfish have been attacked by kingfish over 1 metre long and I’ve been showered in spray in the ensuing carnage. I’ve regularly have stingrays and kingfish cruise past, sometimes almost within touching distance, whereas skilled colleagues who are fishing within 25 metres often see nothing. I’m sure the fish are seeing them and moving further out to avoid detection. There is no doubt that I am seeing many more fish up close than I ever used to before. This must be down to what I am wearing and the change in approach. I basically have summer and winter camouflage clothing sets to handle the inhospitable conditions encountered on the flats at different times of the year. There is no shade in summer and no cover in winter so it is important to dress with this in mind. Layering is essential so carry a waterproof pack capable of accommodating the extra layers. I use a Simms Dry Creek Z backpack and it is submersible. In heavy rain squalls it is simply brilliant. Patagonia also has a comparable product. In summer I wear Stoney Creek camouflage mesh pants and a variety of uber light weight, long sleeved camouflage breathable tops from a wide variety of manufacturers. These are generally in the Realtree pattern. I select the pattern carefully to match the backgrounds where I typically fish. I generally pair these tops with a Sitka Optifade Open Country windproof sleeveless vest if there is any breeze. Open Country is a sand / grey pattern which blends in well on the flats. I even have a waterproof, breathable Sitka raincoat in the same Optifade Open Country pattern specifically for wading the flats in the rain. 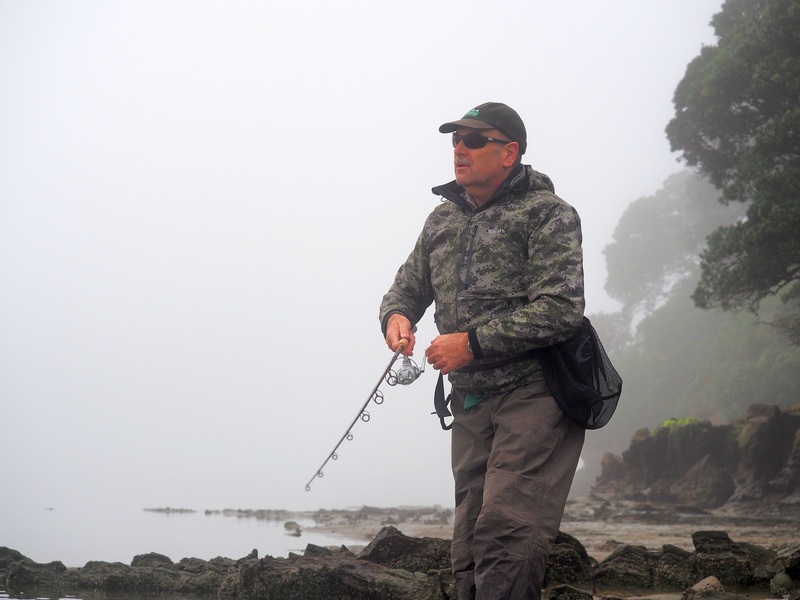 I also use a Simms Windstopper Hoody jacket in Camouflage Agave pattern if I am fishing with a native bush backdrop. As you can see in the image above it blends in really well. Sometimes if I’m fishing an estuary with a white sand foreshore then I’ll switch to a pair of longs or shorts in a colour that matches the sand and wet wade in flats boots. I’ll still wear a camouflage top to blend in with any vegetation on top of the dunes or in the background hills. To prove this combination also works when I was fishing the Awana estuary earlier this month I had mullet coming within half a rod length before they realised I was there and scuttled off. In winter I switch to a thicker pair of Stoney Creek pants, again in drab Bayleaf or Realtree camouflage, that are wind resistant. If the weather gets really ugly then I’ll wear breathable thigh or chest waders and don a waterproof or windproof camouflage jacket. Unfortunately not all of the camouflage patterns available are ideal for the NZ landscape, especially the more remote barren flats, so it is important to try and match the pattern to the back drops encountered. The reality is that there is very little bespoke camouflage gear made for flats anglers so you have to make do with hunting gear designed for local conditions. Having worn it extensively for over 12 months now I’m sure that the Sitka Optifade Open Country camouflage pattern is really well suited to NZ flats use. It seems to provide a further step up in performance over standard camouflage patterns. However, I wouldn’t use this pattern if I was fishing bush clad rivers as it probably wouldn’t blend in so well. In that situation I’d likely switch to the Optifade Timber pattern. There are a lot of anglers and guides hunting back country trout are wearing camouflage clothing now and are convinced it helps them get closer to trophy fish. Give it a go. It should help. Just so you know I do not have any relationship with any of the clothing suppliers mentioned in this post. I prefer to purchase all of my fishing gear so that I can assess it objectively. The items mentioned were all purchased and are working well which is why I’m happy to endorse the brands. The brands are only mentioned to give those who are interested a better idea of the camouflage patterns I use. Great post Alan! I’m off to the store to buy some new layers! Hunters wear camouflage clothing to reduce their chances of being seen and there is no doubt that it improves success rates. Does the same hold true for anglers, especially those stalking the saltwater shallows armed with a fly or spinning rod? very interesting stuff – you’ve definitely given me food for thought as I like to try for kingies along the typical Auckland Waitemata low tide zone – with a mix of pale cliffs, papa rock, and coastal vegetation in the background. Also cockle shell banks. Very similar to the image at the top. Is your vest in the ‘Open Country’ colour? It looks a bit greener in the image on the review story, but I think it’s more of a grey in reality. There’s a similar colour digi pattern being marketed by a NZ company called Hunters Element, in the ‘Bare’ colour – available at Hunting & Fishing. I was thinking that might be a decent alternative, a bit cheaper than the Sitka stuff. There are also some interesting camo shirts at army surplus type shops – in a grey/tan colour range which are mostly used in the Middle East etc. But they are typically cotton, rather than performance fabric.